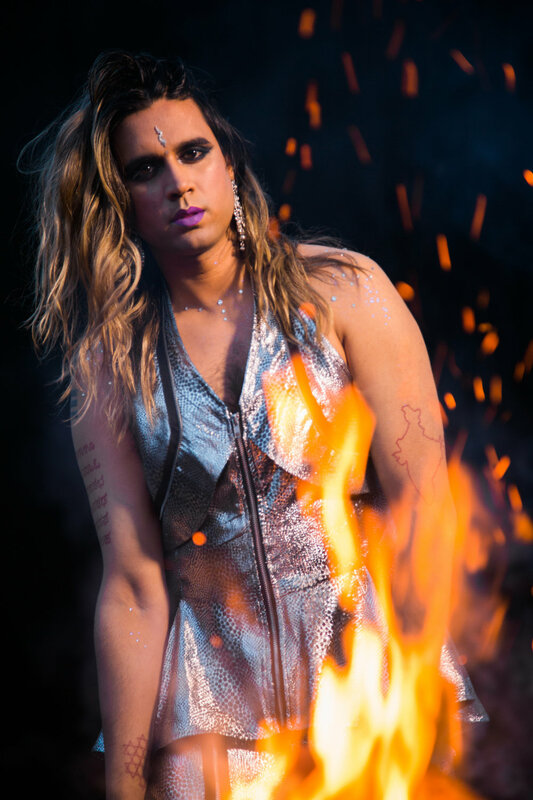 Vivek Shraya is a multi-talented trans female artist based in Canada that creates work in multiple mediums ranging from poetry, essays, music, film, and photography. Recently, Vivek had an exhibition, Trisha, of photography where she recreated images of her mother, on view at the Ace Hotel in New York. Her latest book I’m Afraid of Men launches this month, a non-fiction book where Vivek looks at and dissects situations on how ideas about masculinity have been imposed on her from a young age. I was able to have the pleasure to discuss with Vivek her exhibition Trisha, her newest book I’m Afraid of Men, and what she has planned next. Alexandria Deters: Your latest exhibition Trisha was very moving and powerful, partially because of how the images you chose of your mother seemed timeless, and you look more sisters than mother and daughter. How did it feel for you when you saw your photos in conjunction with your mother’s? Vivek Shraya: Truthfully, the first time I saw the photos of myself, all I could see was the differences between me and my mother, not the similarities, which contradicted the intention behind the project. But over time, it's become clear that this is a project about those differences as much as it is about the similarities between me and my mother. Those differences are essential to who I am, and reflect the ways that I have resisted some of the forms of misogyny that my mother experienced, and that I inherited. In your statement you write “But the rest of me has always wished to be you…. Then I remind myself that the discomfort I feel is less about my body and more about what it means to be feminine in a world that is intent on crushing femininity in any form. Maybe I got my wish to be you after all.” By doing this series do you feel that you have gone full circle with your relationship and understanding of your mother? I don't know that I will ever understand my mother but writing that essay did allow me to consider the ways my experiences of misogyny mirror ones that my mother has experienced, despite our different bodies, histories and locations. "I don't know that I will ever understand my mother but writing that essay did allow me to consider the ways my experiences of misogyny mirror ones that my mother has experienced, despite our different bodies, histories and locations." You write in your latest book I’m Afraid of Men, “What would my body look like if I didn’t want affection from gay men and protection from straight men? What would my body look and feel like if I didn’t have to mold it into both a shield and an ornament? How do I love a body that was never fully my own?” (p. 31) I really related to this statement personally, what advice would you give a young queer person today who is facing many of the same internal struggles? In an ideal world, my advice to queer youth would be to resist the pressures to re-mold who you are, what you look like, who and how you desire. But my self-molding was a survival strategy, and unfortunately, the world hasn't changed drastically enough to prevent younger queers from having to adopt similar strategies. My best advice then would be to surround yourself, if possible, with other queers, even if only on social media, as a way to reflect non-normative ways of existing, and potentially to provide a support network. "In an ideal world, my advice to queer youth would be to resist the pressures to re-mold who you are, what you look like, who and how you desire. But my self-molding was a survival strategy, and unfortunately, the world hasn't changed drastically enough to prevent younger queers from having to adopt similar strategies. The next book you will be releasing, Death Threat is a comic book about the hate mail you received from a stranger in 2017 and your responses to it, created in collaboration with the artist Ness Less. What made you want to tell this story and to illustrate this experience in comic book form? My appreciation for comics and graphic novels has grown in recent years, especially as a genre that allows for a kind of wacky, unpredictableness, and turning the messages I received into a comic, especially because of their poetic and vivid quality, felt fitting. It also feels like an opportunity to reclaim my power in this interaction. You have done, and are doing, so many amazing projects and collaborations, what is next on your agenda after your #IMAFRAIDOFMEN 2018 Book Tour? Aside from Death Threat, which will be out in Spring 2019, I am excited to explore artistic mediums that I haven't before as a way to keep challenging myself.